The Georgia Tech Hotel and Conference Center is Atlantas most sophisticated and technologically advanced hotel. It is located in midtown Atlanta and only minutes from Hartsfield-Jackson International Airport. The deluxe guestrooms feature many upgraded amenities including working desks-data-ports-wireless and wired high-speed Internet access and many other amenities perfect for business travelers. The hotel also features a spacious yet comfortable restaurant-Club Room Lounge-indoor pool-health club-full-service business center-and more. The Georgia Tech Hotel and Conference Center is certified by the International Association of Conference Centers and prides itself with its technology and service excellence. The Georgia Tech Hotel and Conference Center offers 21000 square feet of executive meeting space supported by the most technologically advanced equipment and a sophisticated staff of coordinators and technicians. As Atlantas premier full-service IACC facility-the property features wireless and hard-wire technology-enhanced stationary break areas and upscale conference dining facilities. Located on the corner of Spring and 5th streets in the vibrant heart of Midtown Atlanta the Georgia Tech Hotel and Conference Center is the hospitality heart of the Technology Square Complex on the Georgia Tech campus. 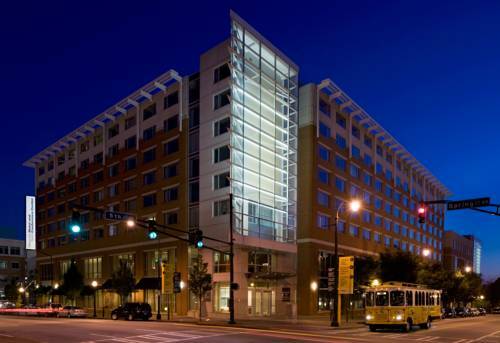 Our innovative Midtown Atlanta hotel is a bustling meeting destination for business leisure and campus visitors who want to connect in the urban hustle of Midtown. Just 15 minutes from Hartsfield-Jackson International Airport getting here is easy. Must cancel 24 hours prior to local check-in time. Failure to cancel within this time will result in a 1 night charge. The Georgia Aquarium is the largest aquarium in the world and features more sea creatures than any other aquarium in eight million gallons of water. Enjoy tours programs and more than sixty exhibits including Coldwater Quest and Ocean Voyager. The World of Coca-Cola shows how the cola empire got its start in Atlanta in 1886.Learn the history of the worlds most pervasive soft drink and check out the largest collection of Coca-Cola memorabilia anywhere on the planet at this museum. At Turner Field catch Atlanta Braves Major League Baseball action. Since 1997 this old-style ballpark has drawn millions of fans who are duly impressed with its combination of nostalgia and state-of-the-art amenities. The historic Fox Theatre is one of Atlantas premiere venues for live entertainment. The Foxs 4678 seat theatre is booked more than 300 performances a year ranging from Broadway to rock to comedy to movies.